Members that want to brave the elements will work out year round. This helps to maintain fitness through the off season and can help keep you active and social in the dark winter months. 8:00 AM at the start of the bicycle path of the Ridgewood Duck Pond. Most of the runners go south past the Dunkerhook and Otto Pehle Areas until the five-mile mark, and then turn around for the return to Glen Rock. 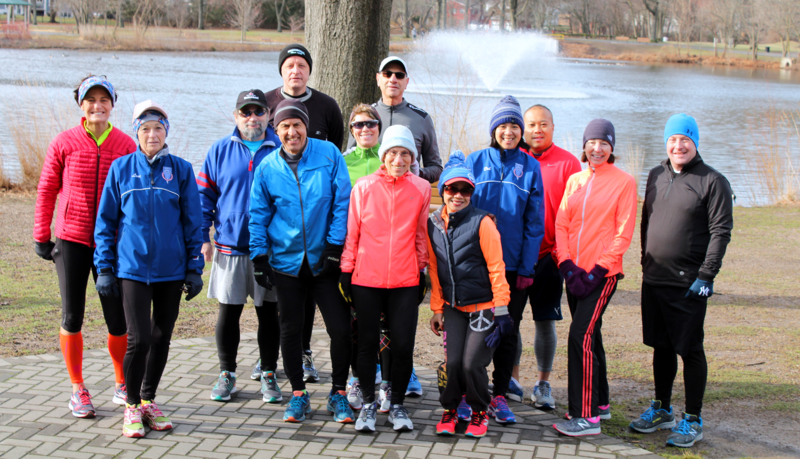 9:00 am at glen Rock Duck Pond near the 2nd parking lot the Intermediate group Run 4 Fun go south on Saddle River path for 4 to 6 miles at various paces. The Sunday long run is conducted year round. Refer to the information above in section Spring/Summer Long Runs (ENDURANCE). The group will meet at the Saddle River Park at the Glen Rock Duck Pond. at 10:00 AM and leave from the southern parking lot. The run will travel through Dunkerhook South to the Otto Pehle Rest Area, and return to Glen Rock for a total distance of seven (7) miles. See the Course Map. There are several alternatives to lengthen or shorten the distance. This weekly run will last through the winter until Mid-March 2014. If you wish to join us, send an e-mail to Dominique Hamel or Mike Machuca so that we can add you to our mailing list. Every Tuesday evening an e-mail will inform you of the expected weather conditions for Thursday and ask those who plan to attend to identify themselves. Hopefully, we will always have many running partners. Although we invite runners that run at all paces, the current list indicates that the group(s) pace will start the season at between 8:30 to 10:00 minutes per mile. Also, in the past we have never missed more than one workout per year. Thus, you can gamble and show up whenever you wish, but be on time if you wish to run with the group.